When I pick up a book and wonder what the heck is going on for over 300 pages, I know that I’ve chosen a great book to bring home from the library. 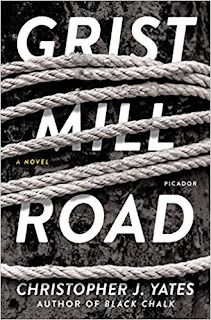 That’s what I got when I opened Grist Mill Road by Christopher J. Yates. I simply kept turning the pages as I was dragged into the world Yates built, continuously trying to figure out where the story was going. This story starts out with three friends, Patrick, Matthew, and Hannah taking part in a horrible event that results in Hannah losing one of her eyes. Matthew goes to jail. Patrick moves away. Hannah stays behind. Years later, Patrick and Hannah have a chance meeting and end up married to each other. The nightmares of that day still haunt their dreams. When Matthew shows back up in their lives, things between the three of them unravel with glaring speed. Mental issues from their childhood rise to the surface and send the trio on a collision course with trouble. Fissures open between them all and ends up with a twist that will leave the reader breathless. How did it get to that point? Christopher Yates weaves a tale from three points of view, and it keeps the readers trying to piece it all together. Slowly, the different narratives come together into one story. Each time we get a segment from one of the three characters, we’re given just enough to propel us towards the next chapter. Each of these snippets is intriguing. Yates uses this character development set against the backdrop of childhood trauma to give us three characters that were rich and deep. There are points that, as a reader, you will hate each of the characters, and then points where you feel almost sorry for them. That’s what makes a great novel, in my opinion. By the end, the reader will have a vested interest in each of the three main characters. We go back and forth in time from the varying points of views. In the end, we get the whole story of the trio of former friends. 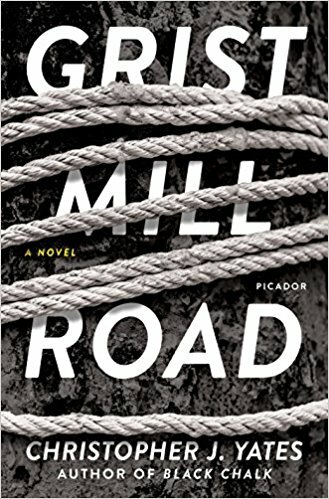 Yates has written Grist Mill Road as a love story, a coming of age story, and a psychological thriller all rolled into one. This captivating read will keep you wondering what’s going to happen right until the very end. Once you get there, you scratch your head a bit. It leaves you with a bit of wonder. There are two possible outcomes to the last chapter beyond the pages. I like that I end up thinking about the characters after the book has ended. If there was one thing I didn’t like about this book, it was only one character. The police officer friend of Hannah’s was completely unlikeable. He had no personality, and acted more like a jealous lover than a protective big brother. It seemed so out of place with the rest of the book. Overall though, this was a fantastic book that I would recommend as a quick, summer read. Craig Bacon did some pretty dumb things as a kid. A lot of those things were attempts to impress a girl.